Made in America, basketball is a sport that stirs a national passion, reaching fever pitch during the NCAA's March Madness and the NBA Finals. 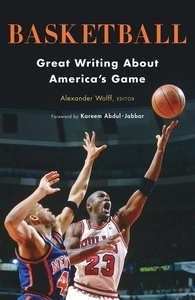 Masterfully assembled by longtime Sports Illustrated writer Alexander Wolff, Basketball spans eight decades to bring together a dream team of writers as awe-inspiring and endlessly inventive as the game itself. Here are in-depth profiles of the legends of the hardcourt--Russell, Kareem, Bird, Jordan, and LeBron--and storied franchises such as the Knicks and Celtics, along with dazzling portraits of the flash and sizzle of playground ball and more personal reflections on the game by some of America's finest writers, among them Donald Hall, John Edgar Wideman, and Pat Conroy. Highlights include James Naismith recalling how he invented the game that would go on to conquer the world; John McPhee capturing the ever-disciplined Bill Bradley as a Princeton Tiger; Peter Goldman's indelible portrait of the life and death of a Harlem Globetrotter; and Michael Lewis's account of the brave new world of NBA analytics. Classic journalism about inner-city basketball by Pete Axthelm, Rick Telander, and Darcy Frey is joined by stories of the game's popularity across America, from the heartland of Hoosier country to an Apache Reservation in Arizona. Cover: Copyright (c) 1996 by NBAE. Photo by Nathaniel S. Butler/NBAE/Getty Images.